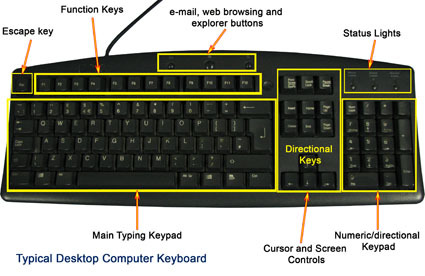 The following standard computer keyboard diagram shows the main parts of a keyboard. Learning keyboard is easy; all you have to do is remembering the position of the keys and how to type with your fingers. Most standard keyboards have at least four groups of keys. It is the first keypad which takes most of the area of a keyboard and look like a typewriter. Caps Lock, Shift, Tab, Enter, Ctrl, Alt, Delete, Windows Start, Backspace and Application keys are included in the main keypad. Arranged at the right side of a keyboard, numeric keypad keys arranged like calculator or adding machine so that to ease entering numbers. These keys are a set of 12 keys which are arranged above the main typing keys. These keys group contains web browsing navigation and other shortcut keys. You can read more about computer keyboard keys here.